10 a.m. Bring out your inner artist during the Dana Point Library’s adult coloring club. The class occurs every Friday 10 a.m.-noon. 33841 Niguel Road, Dana Point. 949.496.5517. 11 a.m. A docent-guided tour highlighting the art collection of rare paintings related to the Mission’s history. 26801 Ortega Highway, San Juan Capistrano. 949.234.1300. www.missionsjc.com. 6-9 p.m. Mouhammed Boussaj will perform classic rock to modern hits. JC Beans. 34114 Pacific Coast Highway, Dana Point. 6-9 p.m. Executive Chef Brian Sundeen invites guests to join him for an evening of cocktails and cuisine prepared in an outdoor kitchen. He and his chefs will engage and interact with guests as they prepare the dishes for the night. Along with fresh seafood, a cheesemaker will hand select cheese and educate guests about different chesses and how to incorporate them into a menu. Tickets are $95 per person. The Ritz-Carlton, Laguna Niguel. One Ritz-Carlton Drive, Dana Point. 949.240.2000. 6:30 p.m. Join Dana Wharf for a 90-minute evening cruise aboard the luxury catamaran. The cruises run Friday and Sunday evenings. Tickets are $49. Dana Wharf Sportfishing and Whale Watching. 34675 Street of the Golden Lantern, Dana Point. 949.496.5794. www.danawharf.com. 6-10 p.m. Some of the most active street artists from Los Angeles will host a gallery over the weekend. More than 20 artists are scheduled to display their work and installations. Food, music and drinks will be served. House of Trestles, 2717 S. El Camino Real, San Clemente. 949.391.2127. Find more information at Street Artist in Residence on Facebook. 6:30 p.m. Be careful what you wish for in this musical! A childless baker and his wife will take on an extraordinary journey to lift the family curse. Along their journey, familiar to fairy tales Cinderella, Jack, Little Red collide as each character attempts to fulfill their wish. Guests will learn about wishes, consequences of pursuing wishes and discover what can happen after happily ever after. The show continues on various days until August 6. Tickets range from $15-$20. Crown Valley Amphitheater. 29751 Crown Valley Parkway, Laguna Niguel. www.lagunanigueltheatre.org/tickets. 7-10 p.m. The county of Orange and OC Parks will hold a free viewing of Finding Dory. Bring a blanket, a picnic or chairs and head to the park. There will be free parking starting at 6 p.m. and the movie will begin around 8 p.m. There will be food trucks. Laguna Niguel Regional Park. 28241 La Paz Road, Laguna Niguel. www.ocparks.com. 7-10 p.m. Feed the Kitty will perform live in the bar and lounge area. They perform every Friday. There is live music Wednesday-Saturday. Salt Creek Grille. 32802 Pacific Coast Highway, Dana Point. 949.661.7799. www.saltcreekgrille.com. 7:30-10:30 p.m. Listen to Olivia Rohde perform live. Barnoa Wine Bar. 831 Via Suerte #106, San Clemente. 949.388.4378. www.barnoawinebar.com. 7:30 p.m. The Wayback Brothers will perform at Harpoon Henry’s. 34555 Golden Lantern, Dana Point. 949.493.2933. 7:30 p.m. The Camino Real Playhouse brings the legendary adventures of Robin Hood to life at San Juan Capistrano’s Historic Town Center Park. Watch as the story’s beloved characters fight to stop the evil Prince John and the nefarious Sheriff of Nottingham. 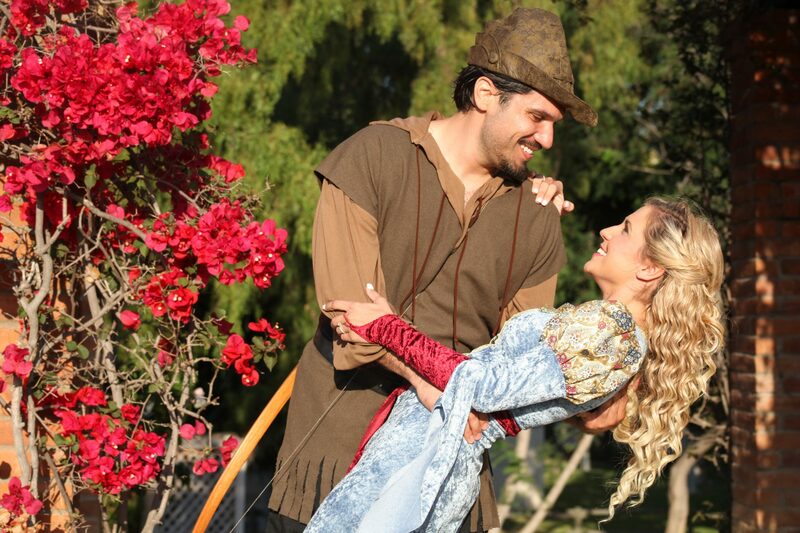 See Maid Marian capture Robin’s heart as the history of England comes to San Juan Capistrano. Attendees will be treated to sword fights and an archery contest. The show runs each weekend through July 30. Tickets are $15. Historic Town Center Park. 31776 El Camino Real, San Juan Capistrano. 949.489.8082. www.caminorealplayhouse.org. 7:30 p.m. Heroine Tracy Turnblad twists her way into Baltimore’s stardom while fighting for integration on a local TV show. The show is held at various times until July 30. Tickets range in price depending on seat. The Laguna Playhouse. 606 Laguna Canyon Road, Laguna Beach. 949.497.2787. www.lagunaplayhouse.com. 7-10:30 p.m. Listen to music from Voodoo Groove at Iva Lee’s. 555 N. El Camino Real, San Clemente. 949.361.2855. www.ivalees.com. 8-11 p.m. Listen to Phil Vandermost perform live. OverVue Lounge, Laguna Cliffs Marriot. 25135 Park Lantern, Dana Point. 949.661.5000. www.lagunacliffs.com. 10 a.m.-11 p.m. Weekend events for Festival of the Arts will feature Art Talks & Tea, “a stimulating and fascinating series featuring our Festival artists.” A group of artists will share how they portray the female figure in their different art styles and mediums and discuss their inspirations, muses and techniques. More events are available online. Festival of the Arts, 650 Laguna Canyon Road, Laguna Beach. 800.487.3378. www.lagunafestivalofarts.com. 9 a.m. Armstrong Garden experts will show participants perennials and shrubs that provide blooms and beauty all year long. Armstrong Garden Center. 32382 Del Obispo Street, San Juan Capistrano. 949.661.6666. www.armstronggarden.com. 9:30 a.m. Join Tree of Life’s Patty Roess for a workshop to learn how to garden with pots in small spaces. She will cover the basics of design principles for potted plants and highlight natives that thrive with minimal maintenance. Tree of Life Nursery. 33201 Ortega Highway, San Juan Capistrano. 949.728.0685. www.californianativeplants.com. 9:30-11 a.m. Learn about designing small container gardens during a free class during the 2017 Smart Gardening 101 Series with Goin’ Native Therapeutic Gardens and the University of California Cooperative Extension (UCCE) Master Gardeners. Reata Park and Event Center. 28632 Ortega Hwy., San Juan Capistrano. 949.606.6704. www.goinnative.net. 10 a.m.-12:30 p.m. Join Ocean Institute scientists on a whale watching cruise aboard the R/V Sea Explorer to view wildlife that make the coastal waters of Dana Point their home. Tickets are $45 for adults, $35 for seniors and active-duty military and $25 for children. Members receive a 10 percent discount. Ocean Institute. 24200 Dana Point Harbor Drive, Dana Point. 949.496.2274. www.ocean-institute.org. 12-7 p.m. Designer Erin Knight will join Jean-Jacque Mamie during a special summer trunk show. Monarch Beach Resort. 1 Monarch Beach Resort North, Dana Point. 949.240.2226. www.jeanjacquemamie.com. 2 p.m. Heroine Tracy Turnblad twists her way into Baltimore’s stardom while fighting for integration on a local TV show. The show is held at various times until July 30. Tickets range in price depending on seat. The Laguna Playhouse. 606 Laguna Canyon Road, Laguna Beach. 949.497.2787. www.lagunaplayhouse.com. 5-10 p.m. Join the San Juan Capistrano Equestrian Coalition to dance under the stars. This is a free family event to preserve and protect the equestrian lifestyle in San Jun Capistrano. Rancho Mission Viejo Riding Park at San Juan Capistrano. 27174 Ortega Highway, San Juan Capistrano. www.sanjuanequestrian.org. 5:30 and 8:30 p.m. Comedy in the OC will present a special graduation of its student stand-up comedians at the Camino Real Playhouse. Tickets are $12 per person. 31776 El Camino Real, San Juan Capistrano. 949.489.8082. www.caminorealplayhouse.org. 6-9 p.m. Olivia will perform an array of covers and original music. JC Beans. 34114 Pacific Coast Highway, Dana Point. 6:30-9:30 p.m. Michael Wallace will perform live. Michael performs every Saturday. There is live music Wednesday-Saturday. Salt Creek Grille. 32802 Pacific Coast Highway, Dana Point. 949.661.7799. www.saltcreekgrille.com. 7-10:30 p.m. Listen to music from Family Style at Iva Lee’s. 555 N. El Camino Real, San Clemente. 949.361.2855. www.ivalees.com. 7 p.m. On Saturday evening, July 29, at the San Clemente Baha’i Center host an evening of music and stories from the Baha’i Faith with Luke Slott. In honor of the Bahá’í Community’s 2017 celebration of the 200th Anniversary of the Birth of Bahá’u’lláh, the Founder of the Bahá’ï Faith, Luke has released a new album entitled “Year of the Nightingale.” It is free and open to all. On Sunday morning, July 30, the theme for this Soul Food event is “A Time for Renewal” will center on rejuvenation and transformation and how these two principles affect material and spiritual development. San Clemnte Baha’I Center, 3316 Avenida Del Presidente. 949.791.9192 or 1.800.228.6483. www.bahaicenter.com. 8-11 p.m. Listen to Rain Cross Trio perform live. OverVue Lounge, Laguna Cliffs Marriot. 25135 Park Lantern, Dana Point. 949.661.5000. www.lagunacliffs.com. 11:30 a.m. iHeartYoga holds a Bend & Brew session at Left Coast Brewing Company’s tasting room in San Clemente. It’s a one-hour yoga class followed by a pint of beer. Admission $10. 1245 Puerta Del Sol, San Clemente. 949.363.3152. www.iheartyoga.com. 1 p.m. Heroine Tracy Turnblad twists her way into Baltimore’s stardom while fighting for integration on a local TV show. The show is held at various times until July 30. Tickets range in price depending on seat. The Laguna Playhouse. 606 Laguna Canyon Road, Laguna Beach. 949.497.2787. www.lagunaplayhouse.com. 2:30-6 p.m. Every Sunday through July enjoy music from a variety of bands. This week’s bands are Small World Band and Dead or Alive: The Bon Jovi Experience. There will be food and beverages for sale. A free shuttle service will be provided from Dana Hills High School from 1-7 p.m. The event is free and open to the public. Sea Terrace Park. 33501 Niguel Road, Dana Point. www.danapoint.org. 4-7 p.m. Redneck Rodeo will perform live. StillWater Spirit & Sounds. 24701 Del Prado, Dana Point. 949.661.6003. 5 p.m. Be careful what you wish for in this musical! A childless baker and his wife will take on an extraordinary journey to lift the family curse. Along their journey, familiar to fairy tales Cinderella, Jack, Little Red collide as each character attempts to fulfill their wish. Guests will learn about wishes, consequences of pursuing wishes and discover what can happen after happily ever after. The show continues on various days until August 6. Tickets range from $15-$20. Crown Valley Amphitheater. 29751 Crown Valley Parkway, Laguna Niguel. www.lagunanigueltheatre.org/tickets. Surfing Heritage & Culture Center (SHACC) has partnered with the Huntington Beach Art Center (HBAC) for the Women of Surfing: Art & History, the art center’s second exhibition of a three-part-series celebrating women in the arts, delving into the artworks of national and international artists who have an intimate relationship with the ocean and the sport of surfing. The exhibit runs until Sept. 2. 110 Calle Iglesia, San Clemente. 949.388.0313. www.surfingheritage.org. 8 p.m. Bring the family for a screening of Secret Life of Pets under the stars. The event is free. Casa Romantica. 415 Avenida Granada, San Clemente. 949.498.2139. www.casaromantica.org.